How fitting... There were pink tinged clouds aloft as we set up for our annual soiree. Debbee worked, along side the other artists, unpacking great boxes of her latest creations. All were cradled lovingly, placed, tweaked, arranged and...placed again... with the care of the creator. Together, we ignored the storm that brewed west of us and charged forth with the preparations for our event. Debbee was both serene and supercharged! She was deeply moved by the effort we had made, and even more so by the talent that had gathered for the event. She moved about her fellow artists lending encouragement, breeding laughter and dolling out her fabulous brand of "kissy tattoos"! Eleven years ago Debbee Thibaut started a storm herself. She launched a line of handmade, limited-edition designs with the help of a small crew she assembled and ensconced in a workshop in Southern California. 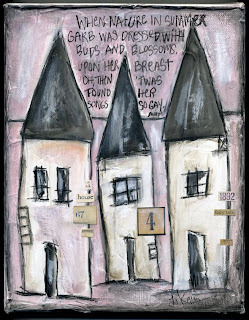 Condensing clouds of charm in papier mache with the most painterly of details I know, Debbee created perhaps the first "collection" of contemporary American folk art. She worked from her heart, sculpting fetching creations that captivated folk art enthusiasts coast to coast. She melded the methods of traditional craft to her own fresh brand of charm and everyday zeal for the seasons, the nostalgia of holidays and the realm of make believe. Debbee's work speaks to me with a warmth so familiar it's haunting. I love the weight of her work in by hands... the density of the firm and textured surface that seems to absorb paint and push back colors with a commitment to multiple hues and shaded layers. I can tell it's sculpted with hands that know today's joys, and adorned with a reverence for old things. Her work shows a depth of creativity, clear and true. Debbee is a born storyteller. Her work included us in her daydreams, and tells us of her childhood and gentle hopes for her grandchildren. Debbee is doing what she was born to do, and we are the luckier for it. Debbee is brave. 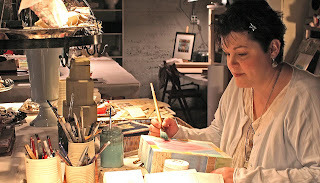 There are so many that have followed the path she has made in the forest of art and craft. I will argue firmly that she started it all. She gave room to the medium and rise to the form. 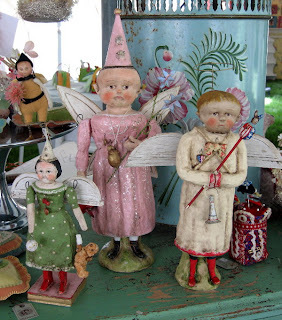 She has angels, fairies, a cadre of old dolls, a collection of barnyard creatures, and anthropomorphic veggies in her corner that are sure to agree with me! 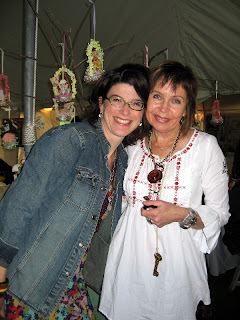 So, let's pause and thank Debbee, not just for creating all the magic that has come from her workshop over the years, but also for the storm of sentiment for folk art that she has truly inspired. 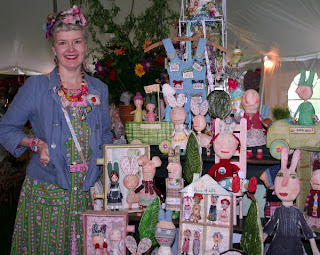 So many artists and enthusiasts, myself included, were awakened to the mood of contemporary folk art thanks to Debbee and her work. I admire Debbee for singing her song. And along the way she has grown with new ideas in the face of challenge. Today, she is charting new territory with a line of fabulous blown glass ornaments. In recent months, Debbee has made countless trips to Germany and has actually found the factory where they made the exquisite kugles and blown glass creations more than 100 years ago. It is there that she is crafting new work. Once again something new, with a devout respect for the old ways. Debbee you are elegantly aloft. A beauty and my friend. For this and more I am grateful to have you in my life and ask that we salute you! Three cheers for you Debbee. ...and so it continues...the moments fold into stories, and pictures provide the medium of memory. The grass was sodden and the sky was dark, but hearts were light and spirits full...the tent of treasures held us captive. Friendships ignited through art. We gathered. Kevin and his treasured Emily with her treasures! and so ...it really was magic. Thanks to all who were there to make it so. ....So many of you have asked, how can I attend? This gathering is intimate and held at my home. I do want to widen the circle, so I am already planning two events that will be open to the public. We will gather in downtown Warwick to celebrate art at a newly opened gallery space...watch for details on our schedule. Jennifer Lanne and Laurie Meseroll have agreed to be our featured artists at these events which will be held in August/September and November, respectively. 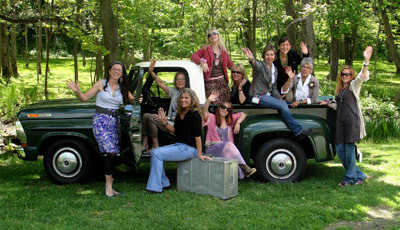 ...Following the public events we will be hosting invitational activities for collectors and enthusiasts as well...including a field trip to Jill Wiener's Earth Girl Pottery Studio for a picnic and pottery fun, and of course some merriment at my home...we sure will keep you in the loop! The collection of individuals who joined the festivities this past weekend represent the most glorious array of talent, style and friendships I have ever known. Nineteen artists, 100 collectors...everyone an enthusiast, some life long friends and some women I had never met. We celebrated on my front lawn under a big white tent. We made the most memorable of gatherings. Yes.... it was divinely lovely, yes... art abounded, but most of all it was an intense and heartfelt conflagration of spirit and soul. It will take many posts for me to share the day of the party....this first post is just a tease of pictures of the artists and helpers as we set up on Friday ...anticipate additional posts on each of the artists present, their work, and ...the aftermath. After all, I did find some cunning size 6 high heels in the garden, cupcake frosting on the walls and punch cups on on porch.....sigh....the memories will last me a lifetime for sure. Stacey Bear called yesterday to tell me that she had. "...the best time she has ever had". Jody Battaglia said there was enough creative energy to blow the roof off the tent (the storm almost did!). Debbee Thibault said the art of our age was present... I am left speechless and words are some of my favorite things. So here are some images of us as we set up the circus...everyone was relaxed and excited at the same time, many happy helpers were on-hand, we loaded and unloaded... walls, props, art. We wore jeans, we worked hard, we laughed 'til we cried. We made the fairies fly, the flowers bloom and our hearts sing. Thanks to each and every person who was there to set up and prepare for the party. You made it possible. 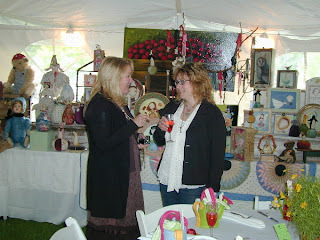 PS.... see Nicol Sayre's blog for more pictures, and visit here again on Saturday for more images of the PARTY itself! Making friends is not unlike the slow and wonderful accumulation of beloved objects. 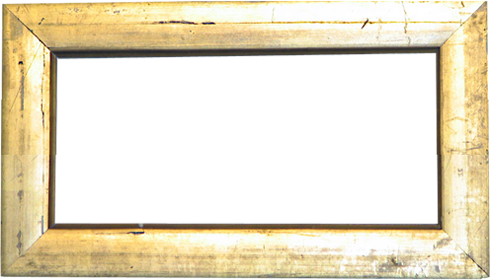 Peek into a cabinet and you'll see a rare concoction of objects melded together through sweet circumstance. Look at a group of friends... the odd stories of how these friends came into each other's lives and rooted themselves, is even sweeter. 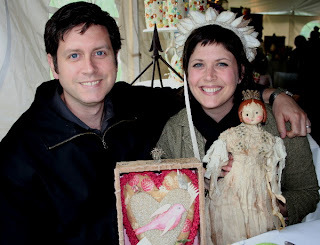 We met (we argue when we actually first met, though I am sure...) at the Rothman Doll & Bear show). She was unforgettable...beautiful, tons of dark hair, fab purse....That was the summer of 2001 and the Cindy McGuire Bears in my display were appealing to her. She and a friend bought a few... and then months passed before I saw her again. Another show...more bears...nice conversation...By now I realized this was nice gal...she might just want to come to the party I was hosting at my new home in Warwick. It was tea under the apple trees. A small gathering...less than 20 of us with my family there too! And so it continued, party, show, another event....she came, she saw, she conquered. She had driven to IKEA that next day and had bought that same cabinet and somehow fit it in her itty-bitty sportscar. 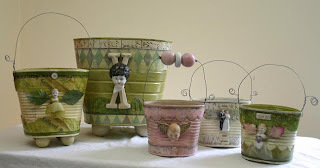 Now, she was filling it with these wonderfully fun, new creations...she had discovered the realm of folk art and there was no turning back. 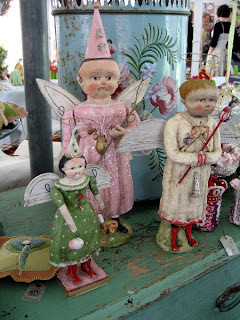 She was smitten with all things handmade, folk art and the exciting world of decorating, creating and collecting. Gone were her matchy-matchy chairs, the silk floral arrangements and the coordinating dishes. In were the chippy benches, odd glass ware and old quilts! It's years later the student has far surpassed the teacher! Her home is amazing, her collection un-paralled and her heart bigger than the sun. She has been adopted by my family and designated the official staff photographer. 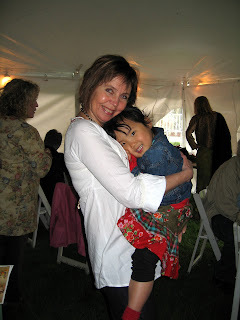 She has held my babies (two born since we met), seen me cry, and sobbed in my arms. We have laughed over silly things and simply cannot understand how anyone can not love all the crazy things that what we adore! This is what friend's are for ...to treasure and enjoy...to have by your side while the stories of tomorrow unfold. They are the sweetest of life's collections, the most vivid and rare...And if I had a cabinet for my most precious memories, those with Rosanne would be on the top shelf in the best of spots! There are those evenings to yourself that are magic...time to think to create, and to dream...wide awake and alert with the entire world waiting for you alone to discover it. These nights, I hop on the web and catch a wave...moving from one site to the next...clicks, currents, time and tide. Have you ever really caught a wave? Have you ridden one to it's term and tumult, thrown feet over head, your body twisting towards the sand? A quick look back and you see the froth and foam that bore you to the shore. You land and explore the beach as never before, emerging from the sea in a spot you could have never chosen. I know why they say you "surf" the net....it reminds me of those summer days at Jones Beach and the waves at West End II. There and back again, the ebb and flow of that dark water...losing track of where you just had been.... and moving along....just like the clicks and mood that bring you to the next web destination...it's a beautiful thing to ride the tides. One night, late and quiet, I stumbled across Lisa's website. There was her craft.... light, layered, and perky.... Styled in a way that was completely appealing in texture and color. A rip tide of a current pulled me in for a closer look and decided I needed to get in touch with her and see if we could work together. Then what did the sea of emails bring me in the next few day....oddly enough, an email from Lisa Kaus. Had she been riding that same wave? There we were in the vast sea of cyberspace, reaching out...dare I say "concurrently"! Lisa sent a batch of art work to Earth Angels, and another, and another and as soon as her creations arrived they were gobbled up. Then, by our special request, she started to bake those cupcakes... we all know I have a "thing" for cupcakes! 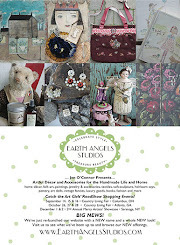 I am honored that Lisa makes these yummy 6x8 treats for Earth Angels. As well as those house...the tinnies...the art dolls, and those canvases! Yum! 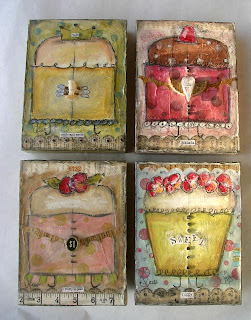 We love when the boxes arrive....we love finding collectors for her work, and we cannot wait to see what she does next! Lisa Kaus creates her paintings, assemblages and sculptures in colors gathered from her garden. They prance across canvases, tin and wood with abandon and evident affection for a box of 64 Crayolas. 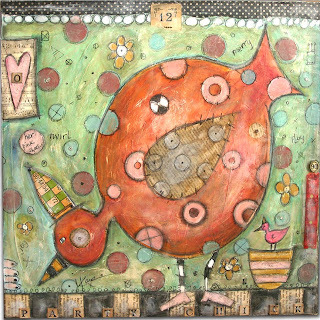 A delightful depth of texture is evident in her work with her use of multiple mediums. 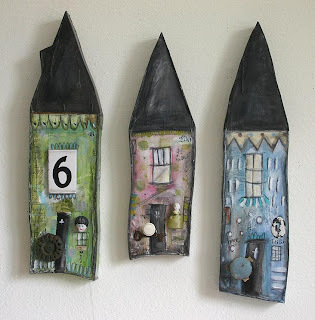 She uses paints, pencils, crayons, oil pastels, ephemera and found objects in her works. Many of her paintings are covered in beeswax which adds a mellowness that is not always visible in photos, but is as delectable as the baker's fondant it resembles. 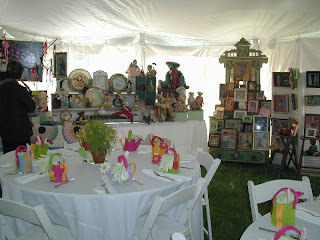 Deliciously colored and textured, her creations are often displayed in festive groupings. 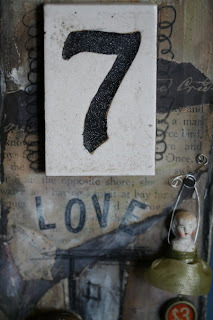 Lisa loves to encourage collectors and customers to have art in their homes. She says, "art loves company, open up your walls.". And I must agree! 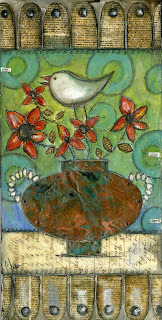 Original art adds dimension, color and soul... We are thrilled to have such a fabulous selection of Lisa's work...and how lucky are we that Lisa will join us at our 6th Annual Spring Soiree here in Warwick two weeks from today...Along with her collectors, I am excited to meet Lisa and have her join in the fun. Before she heads east, she is sending us some goodies in advance. We've posted a few to the site and more are shown here...email us if you'd like to know when more creations arrive....the surf's up!